Author/Opus: This is the 125th puzzle from our contributing puzzlemaster Murat Can Tonta. 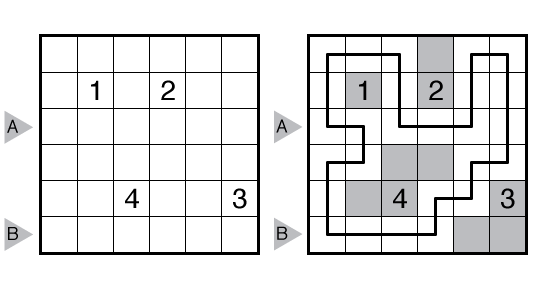 Rules: In this variation of Nurikabe, the no 2×2 ocean rule is removed and instead all ocean cells must belong to a single closed loop. Specifically: Divide the grid into regions called “islands”, each containing exactly one of the given numbers and with the same area as that number. Islands can only touch diagonally. A single closed loop (without intersection or crossings) must be drawn in all remaining cells. Answer String: Enter the length in cells of the horizontal loop segments from left to right in the marked rows, starting at the top. If the loop only has vertical segments in the marked row, enter 0. Separate each row’s entry with a comma. This example has the key “12,3”. 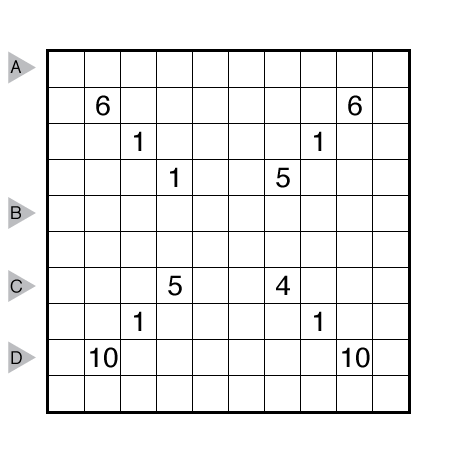 Note: Follow this link for classic Nurikabe puzzles on this website and this link for other variations on Nurikabe puzzles. 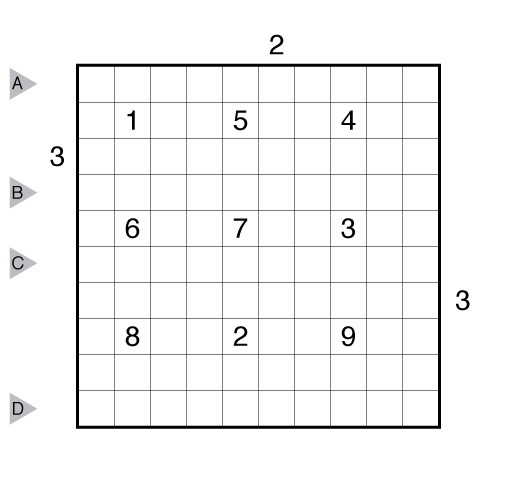 If you are new to this puzzle type, here are our easiest Nurikabe puzzles to get started on. More Nurikabe puzzles can be in The Art of Puzzles, in our beginner-friendly book Logic Puzzles 101, and in the e-book Nurikabe by Ashish Kumar. Author/Opus: This is the 8th puzzle from guest contributor Ashish Kumar. Rules: Standard Nurikabe rules. Also, some borders are drawn in the grid between adjacent cells. One side of each border must be part of the ocean and the other side must be part of an island. 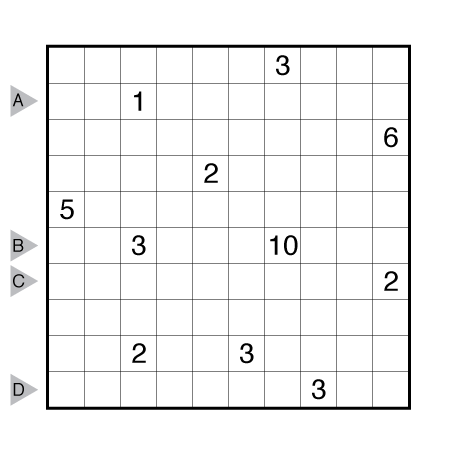 Answer String: Enter the length in cells of each of the black segments (the unnumbered, connected “ocean”) from left to right for the marked rows. Separate each row’s entry from the next with a comma. 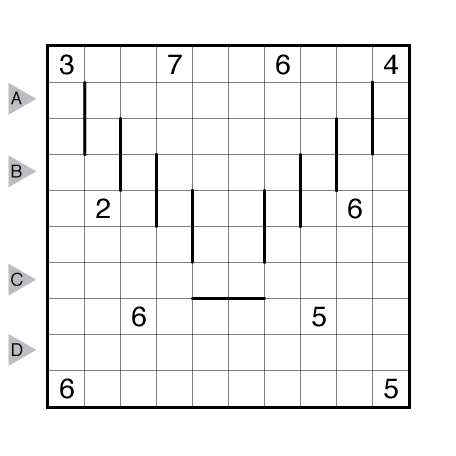 Author/Opus: This is the 7th puzzle from guest contributor Ashish Kumar. Rules: Standard Nurikabe rules. Also, the numbers outside the grid show the number of shaded segments visible in that direction (as in Skyscrapers). A shaded segment of length N in a given direction is taken as a building of height N. A building blocks the view of any building behind it of equal or lesser height. For instance, in the example, there are 3 buildings seen in the fourth row from the left (as 1 < 2 < 3) but only 1 building seen in the third row from the right (as 3 > 2). Author/Opus: This is the 286th puzzle from our contributing puzzlemaster Grant Fikes. Author/Opus: This is the 285th puzzle from our contributing puzzlemaster Grant Fikes. Author/Opus: This is the 237th puzzle from our contributing puzzlemaster Serkan Yürekli. Author/Opus: This is the 3rd puzzle from guest contributor Fidel Zapico. 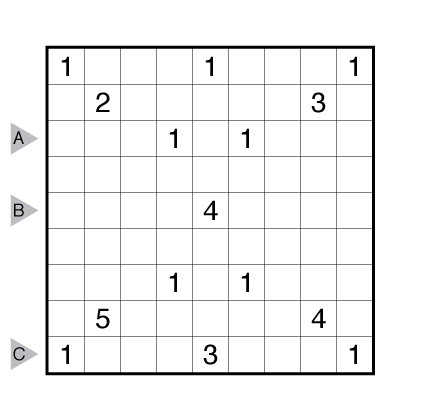 Answer String: Enter the length in cells of each of the black segments (the unnumbered, connected “ocean”) from left to right for the marked rows. Enter both digits for any two-digit number. Separate each row’s entry from the next with a comma. 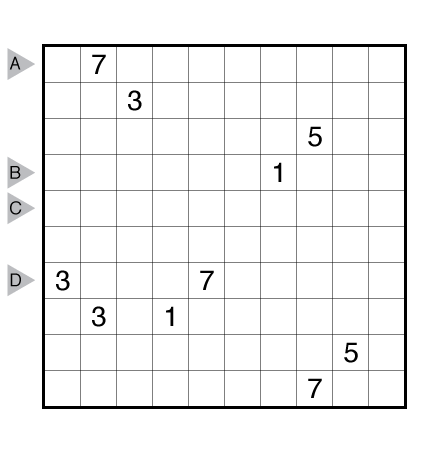 Note: Follow this link for classic Nurikabe puzzles on this website and this link for other variations on Nurikabe puzzles. 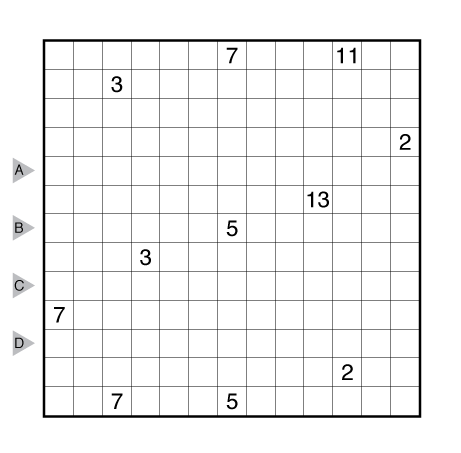 If you are new to this puzzle type, here are our easiest Nurikabe puzzles to get started on. More Nurikabe puzzles can be in The Art of Puzzles collection, and in our beginner-friendly book Logic Puzzles 101.